Edinburgh Fringe festival began in 1947 with the intention of uniting Europe after the World War II. Since then, the Edinburgh Fringe has grown in popularity. The Edinburgh fringe festival involves operas, mime, theater, musicals, comedy shows, children's shows and dance. Venues can range from theaters, cafes to bars and even churches. 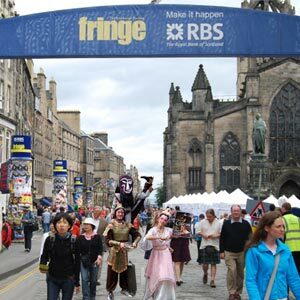 Since then, the Fringe festival has grown in popularity and has become the main Edinburgh International Festival. Edinburgh Fringe festival 2004 included performances by Ed Byrne, The Soweto Gospel Choir, Jimeoin as well as Edinburgh's own Tam White. International performances were schedules at George Square as part of the Edinburgh fringe festival 2004 celebrations. Edinburgh fringe festival 2004 saw record sales of 1,251,997 tickets over 700 groups. This is nearly 35% above the Edinburgh festival sales. Online sales as well as sales at Fringe venues were on the increase this year at the Edinburgh Fringe 2004. Nearly 1,700 shows with 15,500 performers provided a wide variety of entertainment at nearly 316 venues. Some of the popular venues for the Edinburgh Fringe Festival 2004 were The Bongo Club, C Venues, 5065 Lift, Greyfriars Kirk House, Gilded Balloon Caves, Pend Fringe, Pleasance Courtyard, Sweet on the Royal Mile, Traverse Theatre and Underbelly. New initiatives were seen at the Edinburgh Fringe Festival 2004 in the form of improved facilities and services for the performers and the media. Edinburgh Fringe festival 2005 runs from the 7th to the 29th of August.